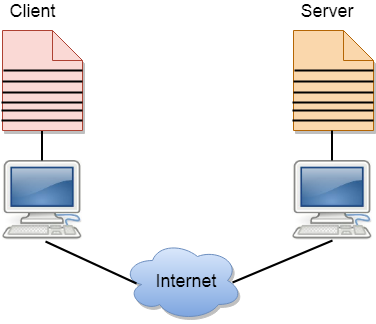 A client and server networking model is a model in which computers such as servers provide the network services to the other computers such as clients to perform a user based tasks. This model is known as client-server networking model. An application program is known as a client program, running on the local machine that requests for a service from an application program known as a server program, running on the remote machine. A client program runs only when it requests for a service from the server while the server program runs all time as it does not know when its service is required. A server provides a service for many clients not just for a single client. Therefore, we can say that client-server follows the many-to-one relationship. Many clients can use the service of one server. Services are required frequently, and many users have a specific client-server application program. For example, the client-server application program allows the user to access the files, send e-mail, and so on. If the services are more customized, then we should have one generic application program that allows the user to access the services available on the remote computer. A client is a program that runs on the local machine requesting service from the server. A client program is a finite program means that the service started by the user and terminates when the service is completed. A server is a program that runs on the remote machine providing services to the clients. When the client requests for a service, then the server opens the door for the incoming requests, but it never initiates the service. A server program is an infinite program means that when it starts, it runs infinitely unless the problem arises. The server waits for the incoming requests from the clients. When the request arrives at the server, then it responds to the request. Centralized: Centralized back-up is possible in client-server networks, i.e., all the data is stored in a server. Security: These networks are more secure as all the shared resources are centrally administered. Performance: The use of the dedicated server increases the speed of sharing resources. This increases the performance of the overall system. Scalability: We can increase the number of clients and servers separately, i.e., the new element can be added, or we can add a new node in a network at any time. Traffic Congestion is a big problem in Client/Server networks. When a large number of clients send requests to the same server may cause the problem of Traffic congestion. It does not have a robustness of a network, i.e., when the server is down, then the client requests cannot be met. A client/server network is very decisive. Sometimes, regular computer hardware does not serve a certain number of clients. In such situations, specific hardware is required at the server side to complete the work. Sometimes the resources exist in the server but may not exist in the client. For example, If the application is web, then we cannot take the print out directly on printers without taking out the print view window on the web.